Straighten teeth, bringing teeth and lips into alignment. Correct an irregular bite- including overbite (lower teeth too far behind upper teeth) and underbite (lower teeth too far forward while upper teeth sit too far back). Closing unwanted gaps- which could be due to tooth loss or expanding crowded teeth. Prolonged thumb sucking, pacifier use, pencil biting or tongue thrusting- these habits can cause abnormal bite by pushing your upper front teeth out (protrude/stick out). Trauma- Teeth can be misaligned by small trauma. In severe cases, when teeth being knocked out and placed back in again, the tooth may fuse with bone, called ankylosis, if it happens to a child, the tooth will not able to align with other teeth. Most of the time, irregular or abnormal bite can just be an issue with appearance but in some cases, it can affect swallowing, chewing, talking or even breathing. Therefore, it is important to address teeth alignment to correct dental or jaw alignment problems. At 360° Dental Care, our expert dental team we will give you a thorough examination including a questionnaire, a clinical and x-ray assessment. We then present a tailored treatment plan that has been customised for you in a consultation appointment. After completing the initial planning and consultation and agreeing on your treatment, we will commence the procedure. In cases where teeth alignment is narrow, overcrowding of teeth, or singular teeth in difficult places, we may need to included an additional expansion step into your treatment. Palatal expansion appliances widen the upper jaw in the lateral direction. This device is attached (and removable) to the upper jaw, spreading the teeth to provide more space for teeth to settle in. If your teeth are not in a difficult position, this step can be skipped. Once your teeth have shifted, and expanded, you may commence traditional braces. Fixed traditional braces use wires and brackets to move your teeth into straighter alignment. 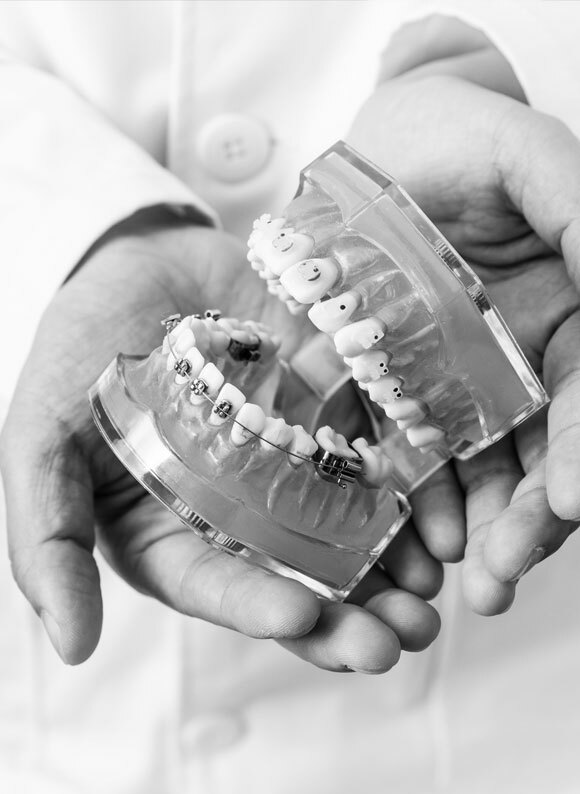 In comparison with newer advancements in orthodontic treatments such as clear aligners, traditional braces remain one of the best ways to achieve dramatic results over a shorter period of time. 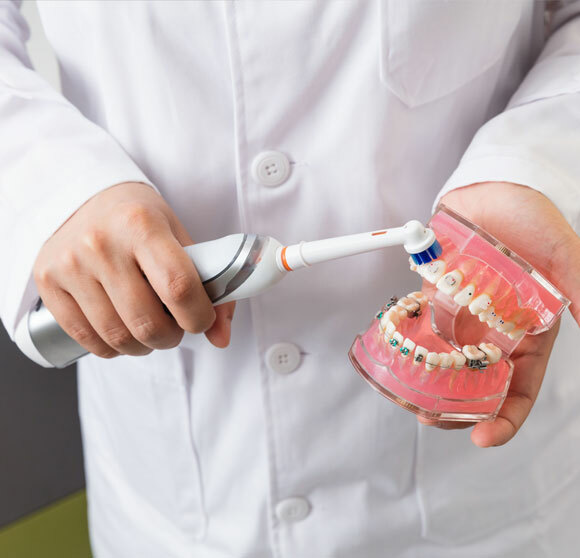 The procedure involves gluing brackets to the front-center of your teeth, and over time with constant pressure being applied to each tooth, the teeth will move into the ideal position. To apply the pressure, a wire is threaded between the brackets and attached with rubber ties. Made of high-grade stainless steel, metal braces are durable and more comfortable than before. You will be scheduled to have your braces tightened every 4-8 weeks. During this time, our dentist will check on the movement of your teeth as well as clean around the braces and change your bands. This will change the pressure of the wire to gradually straighten teeth and correct the bite. Overall, traditional metal braces are the most commonly used option for kids and teens. However, as the treatment is available after all primary (baby) teeth have fallen out and all adult teeth erupted, traditional metal braces are also suitable for adults. If you’re unhappy or embarrassed by your smile – then braces could be the answer. Visit us today for a consultation. It will take more time and effort to maintain good oral health while wearing braces. Food is easily trapped between the brackets and the wire, therefore it is important you diligently brush and floss your teeth as well as using mouthwash after every meal. Smaller bendable floss brushes are also available to remove food deposits between and around the wires. Get a long piece of dental floss and wrap the floss on your index finger. Thread one end of the floss between the wire and your tooth and wrap both ends on your index finger. This will provide control over the movement -the more control you have, the less likely you will hurt your gums. Use firm but gentle pressure to wriggle the floss between your teeth to remove built-up plaque and/or food particles. Repeat these steps between each tooth, ensuring to floss both sides of the teeth.